An Apple patent published on Tuesday suggests the company is interested in water resistant electronic devices. While iPhones are not completely waterproof, Apple made the iPhone 6s and 6s Plus devices nearly waterproof. However Granted by the U.S. Patent and Trademark Office, Apple’s U.S. Patent No. 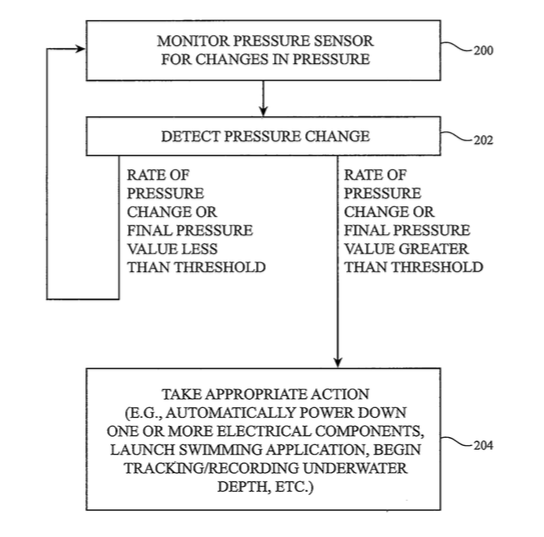 9,367,100 for a “Electronic devices with submersion detection circuitry” details a barometric pressure sensor that detects when an electronic device is submerged in water. If the sensor detects the device is in the water, the device may take various actions. For instance, a swimming app may launch, the device may power down some of its electronic components and start a wireless data backup operation. This patent also explains humidity sensors to determine whether the electronic device is sufficiently dry so that the device can return to its normal functions. This new technology also explains how the device can dry itself by providing power to various electronic components to generate heat until dry so it can return to its normal mode of operation. This patent was first filed for on July 7, 2014 and credits Ganguly; Shameek P as its inventor. We may see Apple implement this technology into their future iPhone, iPad and Apple Watch models. Apple says currently Apple watch is not waterproof.